Self-Storage Detroit: Which Rooms Need To Be Organized? Which Room Needs the Most Attention? The New Year is only a month old, but hopefully you’ve gotten into the swing of things and are enjoying 2019 so far. You’ve gone back to work after the holiday season, and the kids are back in school following winter break. You’re getting used to a routine once again, but at home and the office, and you’re feeling good about things. As you’re settling into the New Year, you may be thinking about reorganizing and rearranging the house. While you’re not quite ready for spring cleaning, you can take advantage of your free evenings and weekends to go through a few rooms and spruce things up. 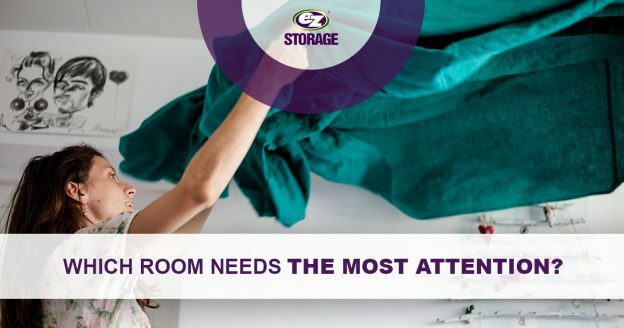 There may be one room that needs more attention than others, and at EZ Storage® in Detroit, we can help you find a self-storage unit for anything you want out of the house, but don’t necessarily want to get rid of just yet. You might spend a lot of time in the kitchen, cooking and entertaining, and you may have noticed over the past few months that your cabinets and cupboards are becoming a bit too cluttered. There are stacks of dishes and cups everywhere, and you have small appliances like a mixers or a toaster stored under the counter. Boxing up some of these extra items and storing them will get them out of the way, and you can keep them for the future or donate them at a later time. Either way, your kitchen will have less clutter! The bedroom (and the bedroom closet) are where you keep most of your personal items such as clothes, jewelry, and perhaps family heirlooms. If your closet is beginning to spill out into the bedroom, then it might be time to go through it and box up certain things for storage. If you have seasonal clothes taking up space, then why not store them until you need them again? Your tank tops and shorts don’t need to take up space when you aren’t going to wear them until June or July. If you’re someone who keeps paper copies of tax returns and other records on file, then your office might be drowning under a pile of paperwork. Your filing cabinet is overflowing, and you have stacks of papers accumulating on your desk. Taking an evening or a weekend to organize and file everything can reduce the mess and make things more manageable. Any files you want to keep can be put in boxes and placed in your storage unit, where they’ll be protected from fire, floods, and other hazards. 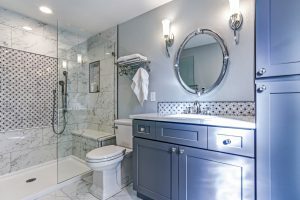 You use your bathroom every morning to get ready for the day, and it has everything you need to get clean and feel prepared for whatever comes your way. However, if your cabinets are getting too full, then it may be time to go through them and see what can be tossed. There might be old bottles of shampoo or old cleaning products under the sink, and it’s often best to just throw those in the trash. If you have towels and other accessories that you want to store, then you can keep them safe in your storage space. Your living room is where you relax after a long day, either in front of the TV, with a good book, or spending time with your family. It can also be where things like backpacks and junk mail are dropped, creating messes that you trip over or look at every time you come into the room. While you can encourage the kids to pick up after themselves, it can also be good to create fewer surfaces in the living room where things can be deposited. If you have furniture that you want to store, or you’re buying a new couch and want to hold on to your old one, then let us help you find the right space for it. At EZ Storage®, we love providing our customers with the ideal self-storage solutions. If you’re cleaning up one or two rooms in your house and there are things that you want to store, then come to one of our storage centers in the greater Detroit area today. This entry was posted in Self-Storage Detroit and tagged self-storage, self-storage companies, self-storage near me, self-storage units, storage near me, storage units on January 30, 2019 by admin.